A breakthrough new Legal for Trade onboard scale is getting plenty of attention in the trucking and transportation industries. From feed and grain to minerals, scrap steel, wood pellets, grease recovery and more, TradeRoute lets drivers bypass the truck scale and conduct business directly to and from their payload, printed ticket and all. TradeRoute is one of very few Legal for Trade onboard scales available in North America. But what makes it most unique is that it operates solely from a parked position where hydraulics are used to engage the scale. Unlike all other onboard designs, TradeRoute’s load cells support the vehicle’s load only during the weigh cycle, eliminating the potential for premature load-cell wear from constant engagement. 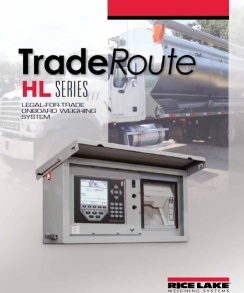 TradeRoute from Rice Lake Weighing Systems is designed to install around the frame of many common straight-truck designs using a combination of frame-hugging weigh modules, a stainless steel junction box, and a weatherproof control center that houses Rice Lake’s 920i® Indicator/Controller and Epson TM-U295 Ticket Printer. The 920i software adds tremendous power and flexibility to each TradeRoute system, which can be customized to the unique needs of each customer. The potential cost savings are huge with a system like this. Carriers can save an enormous amount of time and vehicle wear by not taking constant trips to a certified scale, and multiply that savings across their fleet. They get detailed numbers from each stop and are able to store and transmit those numbers back to their office electronically. Avoid a few overload fines and this system pays for itself quickly.